Like its siblings the snom 720 and 760, the snom 710 is built from the ground up for HD audio and delivers superior, crystal clear end-to-end call quality. 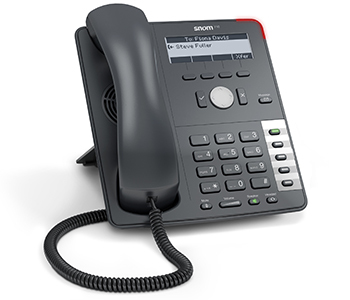 Its sleek ergonomically designed handset has an advanced speaker and microphone system, and the phone supports a broad range of media codecs, including G.722 wideband codec. The snom 710 comes with a preinstalled security certificate for quick and secure provisioning without manual interaction. It also supports the latest VoIP security protocols to ensure secure desktop communications. Advanced remote management and provisioning capabilities including full support for TR-069/TR-111, make the snom 710 an ideal endpoint for service providers of hosted VoIP deployments as well as larger scale multi-site installations. Advanced configuration, management tools and SIP interface also ensure seamless, end-to-end integration with SIP-based IP PBXs and hosted VoIP platforms in a wide variety of business environments. Download the YipTel Snom 710 HD Datasheet (PDF).